HOW DO I ........... Use a BP Monitor? Aluminum, with the arguable exception of magnesium, is the lowest density commonly found metal there is. It should be made out of steel, which is much denser, or brass, which is denser still. The head's composition is not so important, since the sound has to travel a much greater distance (several inches) through the binaurals. What is important about the head is that it be machined airtight for great sensitivity. But the binaurals absolutely must be made out of some respectable metal. So we'll give you one guess what the Littman's binaurals are comprised of. The stethoscopes on this page all have airtight machined heads (click here for more info), manufactured in Japan in the good old days before everyone started outsourcing to China, Indonesia and India, and their binaurals are all chrome plated brass, never aluminum. So if the Littman isn't as good and sells for over 100 dollars, then why are we selling ours for a small fraction of that? Moreover, why is it all new old stock that hasn't been sold after 20 years? No demand. For an entirely stupid reason, but no demand all the same. Nobody has heard of it. Most of the people involved in manufacturing it in the first place are probably in their graves, or at least retired! So if you've stumbled on this page because you searched "Littman" (or "Littmann" - have to make sure to spell it wrong a few times so the search engines find it), and were considering turning away, now you know you've stumbled upon one of those rare well-kept secrets. Here is a chance to get something better than that Benz of stethoscopes you thought you wanted until 5 minutes ago, and for almost nothing! Our lowest profile in-house stethoscope, yet still a top-notch instrument. Dual head, made of aluminum. Don't worry, we wouldn't sell you a stethoscope with aluminum binaurals though. Adult size bell and diaphragm with stabilized ball-bearing mechanism. Precision made in Japan. Both the sensor and spectra are the same thing. We simply tried calling it different things for marketing value, but it made no difference. High sensitivity mirror finish chromed-brass head and binaurals. Airtight chestpiece machining is crucial to sensitivity and professional quality. Made in Japan, not Taiwan, China or Korea. 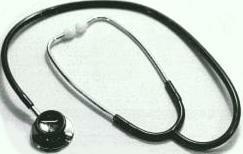 Our highest quality stethoscope. The sensitivity and airtight precision of the Sensor and Spectra, with a stainless steel head. All the attributes of the Sensor and Spectra, and the head has adult and pediatric interchangeable parts (LIKE A SPRAGUE) and a single tube compact binaural (LIKE A LITTMANN CLASSIC) so that you don't have to wear it over your shoulder or carry it in a medical bag. Tucks neatly in your pocket.